Facet joint scapegoat conditions consist of normal age-related structural changes that are erroneously blamed for enacting painful symptoms. The facet joints, much like most of the body, suffer degeneration due to age and activity. 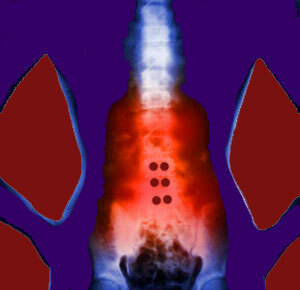 These changes can be visualized using medical imaging and are often viewed as culprits for chronic discomfort. Some facet joint changes are truly pathological in nature and are justifiably blamed for their symptomatic activity. However, many other conditions are simply expected and universal alterations in anatomical form that are devoid of any pathological characteristics. These conditions are called scapegoats, since they accept blame as painful issues, when all along they are innocent of any wrongdoing. Pain may surely exist, but is sourced from some other process that has not been identified and will now never be ascertained, since the facet joints have filled the role of villain and placed the patient on a hopeless path towards fruitless treatment. This vital essay examines how a large number of facet joint diagnoses act as scapegoats and have no scientific merit. We will cite well known medical principles to expose why and how these scapegoat conditions are used as money-generating tools by opportunistic care providers from all healing arts. What is a Facet Joint Scapegoat? Scapegoats exist throughout the larger healthcare system and are found in great numbers in the dorsalgia treatment sector. We have been writing about the scapegoating of innocent and incidental structural abnormalities for over a decade, as this is a major problem that directly leads to misdiagnosis and horrific therapeutic outcomes. The apophyseal joints, much in the same manner as many other spinal structures, degenerate as a completely normal, expected and universal part of life. There is nothing inherently pathological about facet degeneration, just like there is nothing inherently painful or pathological about bulging discs, degenerated discs, general spinal arthritis and mild to moderate cases of spinal and foraminal stenosis, among others. All of these conditions can and do act as scapegoats when doctors choose to implicate them unfairly as origins of pain. The problem is that all of these conditions, including facet joint deterioration, can cause pain in some circumstances. Pain is not guaranteed and is actually the exception to the rule of asymptomatic state for most age and activity-related spinal changes. Patients often do not know any of these facts and simply view diagnostic evidence of structural alteration and assume that these changes are harmful and painful. In many cases, they are not. They are just there and doing no harm. This is proven truth and is indisputable. No reputable study has ever established inherently painful or pathological activity universally experienced with any of these conditions, while countless studies have shown the vast majority of structural changes to be incidental to pain. We once again cite the old medical philosophy that has served doctors well for generations: “Atypical structure is a poor predicator of pain”. In clinical medicine, doctors see patients who experience dire symptoms that are debilitating, yet these patients have few, if any significant structural changes in their spines. In some cases, the symptoms are declared idiopathic, as they should be, but in many cases, the pain is blamed on the worst looking abnormality available, which might be normal disc degeneration, for example. This is scientific blasphemy. Doctors also see patients for unrelated conditions who unknowingly demonstrate extreme varieties of spinal degeneration, yet have no back or neck pain at all. We have seen the imaging studies of thousands of these patients and they look terrifying, despite their innocence. Doctors also cite autopsy evidence of massive spinal deterioration in patients who have no reported history of dorsalgia. Both of these facts support the non-pathological nature of these age-related changes in most people. Now the real problem is when doctors view patients who have pain and also demonstrate significant structural irregularity in the spine. They might have facet joint hypertrophy, herniated discs, scoliosis or spinal stenosis of a substantial clinical presentation. In virtually all cases, the structural changes will immediately be blamed for enacting pain, often without a thorough evaluation of their pathological potential or even a logical symptomatic correlation process. Why Are Facet Joints Used as Scapegoats? In many cases, doctors know that the facet “problems” are really just normal degeneration and simply want to make money. They can not earn if they do not provide treatment and they know that no one will question a diagnosis made with “verifiable” evidence in the form of medical imaging demonstrating structural abnormality when compared to anatomically textbook perfect. The crime here is that no one will question the diagnosis, more than the greed of the doctor. Patients need to be better educated, which is the exact reason for our work. In some cases, doctors really want to help and know that patients have pain. They figure it is better to do something about the most likely causative candidate rather than tell the patient that they do not know why pain exists. The reason for this is their practical experience. Instead of patients feeling elated at the news that there is nothing seriously wrong with their spines, they tend to simply go to another doctor until one will find “something wrong” and begin treatment, even if the diagnosis is bogus. After seeing this time and time again, even good doctors get on-board with “guess-based” diagnoses that do not demonstrate verifiable pathologies just because they are tired of losing the business. In essence, these doctors know that if they do not label the condition to be a problem, some other doctor surely will and profit it from the diagnosis to boot. Another possibility is the Cartesian obsession in parts of the medical community, particularly prevalent in the orthopedic sector. Some doctors just disregard proven evidence of the incidental nature of most degenerative changes in favor of the exact opposite and unproven theory that structure is everything. They disregard the proof of the body’s adaptability and versatility and completely dismiss the role played by the mind in symptom generation, perpetuation and escalation. These doctors are hopelessly lost and should have gone the way of the dinosaurs decades ago.